Known for their endless luminosity, the pave setting was originally developed as a way to increase the brilliance of diamond rings. A timeless look, a pave setting is one in which the side stone diamonds are placed closely together all along the band to maximize the overall brilliance of the ring. Diamond pave rings from Michael M enchant and mesmerize women of all types as the wedding bands crafted by Michael M include stunning contemporary and classic styles. Available in platinum, 18-karat white, yellow, and rose gold, the pave wedding bands from Michael M are crafted to reflect the high-quality standards of a Michael M design and their endless charm. Excited to offer their devoted fans quality jewelry selections, the designers at Michael M offer a mesmerizing selection of pave wedding bands for women. Available at all authorized retailers of Michael M designer jewelry, the pave wedding bands from Michael M exude a constant stream of sparkly brilliance and gleaming appeal. 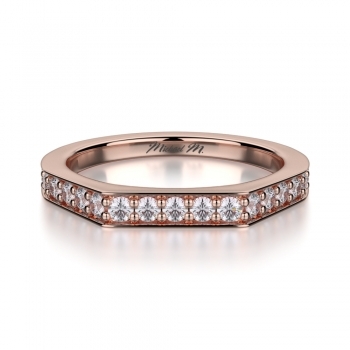 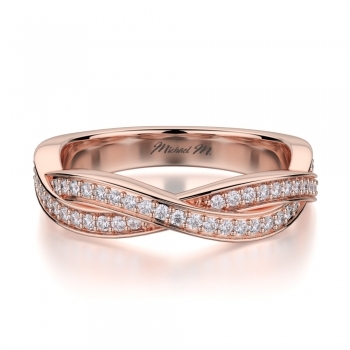 The pave bands include rings with round or brilliant cut stones, some with multiple layers of pave bands, and twisted diamond adorned bands such as the rose gold Michael M's Women's Band R709B and the luxurious three-pave layer Michael M's Women's Band R401B. 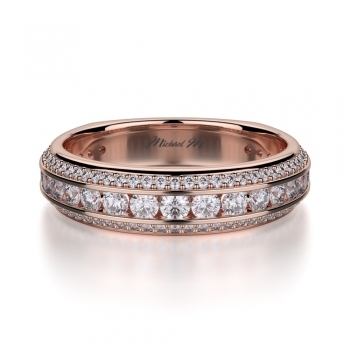 Additionally, the R575B features intricate detailing in the band unique to Michael M and the platinum R697B offers the traditional, clean look many classic women seek. Quickly rising to international jewelry prominence, Michael M designer jewelry has been enchanting women and men alike since 2008. Inspired by his keen eye for jewelry, founder Michael Meksian used his expertise as a designer and launched Michael M to create accessible bridal and fashion jewelry for all women. 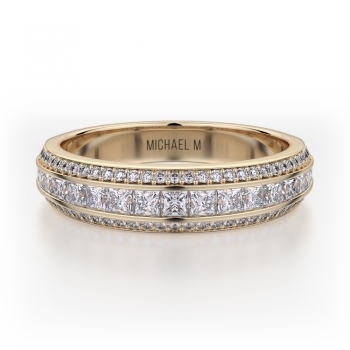 Hand-crated in their California studio, Michael M offers one-of-a-kind pieces that effortlessly fuse contemporary design with traditional looks. Plus, since diamonds truly are, “a girl’s best friend,” the innovators at Michael M know that to create glamorous pieces, “some traditions must be broken.” Keeping this in mind, Michael M strives to create the finest of engagement rings, wedding bands, and fine jewelry items using only high-quality precious metals and top quality white diamonds. 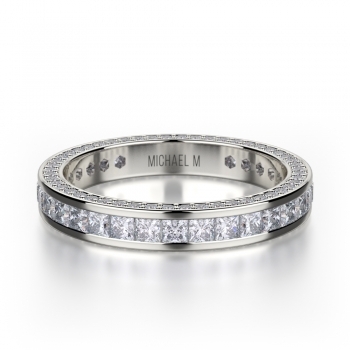 Every Michael M ring can be recognized by its distinct identification number and lifetime craftsman guarantee.